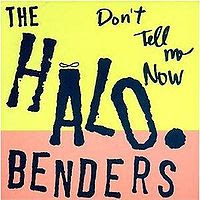 Ah, who could construct an awkward sophomore album better than The Halo Benders? I always think I don't like this record much, then I realize it's that I don't like "Bomb Shelter Pt. 2," which is way too long and right in the middle of the album. I don't know the story behind the song and I don't really care to. And I wouldn't mind it if it was way shorter. As it is, it's just mad boring. Otherwise, there's some roughly recorded gems on this bad boy. "Phantom Power" is a propulsive opener, a track that reminds me of some punk rock song that I can't think of right now. They also pull the sweet move of putting their theme song ("Halo Bender") on their second record, which is always a good call. (They Might Be Giants trumped everyone by waiting till their third–now that's just crazy.) "Mercury Blues" may be the most instantly catchy song on this record, and it's one that I still like quite a bit. I didn't play this record into the ground like their first one, so I still get plenty of mileage out of coming back to it. It's not a whole lot different than their first one in sound and structure, and they make for a good back-to-back listen. "Volume Mode" has a sweet melody that wonderfully muddled by Calvin backing up Calvin on the vocals. That's a whole lotta Calvin, folks. It ends up being a fine song, though. The second side of this record is where things get really good. "Inbred Heart" is one of the best tracks on the whole album, and possibly the most "Built to Spill" sounding. Rarely are the Benders so tightly wound. It's pretty sweet. "Magic Carpet Rider" is another fun one, if you can get past Johnson's nutty lyricism. When Martsch kicks in with the backup vocals, things get good real quick. It's followed by "Blank Equation," initially one of the more pensive tracks on this album, and another one that sounds like Calvin and Doug wrote separate parts and then just used 'em both. It builds up and gets a little wild and totally works. "Crankenstein" is the last track on the record, which is a good place for it. It's hard to tell if Johnson is just free-associating on this track or not. It's sloppy, but good-sloppy. Sort of like the rest of the album, but that's one of the most likable things about this group. I don't know why, but I have an unhealthy love for this record. The Benders pull a bizarre move and release a second album that sounds like it should come before their first. The recording is spottier than the first, the songs are less focused and the whole thing sounds more like practice jams that were recorded in a basement. Having their theme song on here only confuses the point more. I think I love this one because where as the first one is instantly infectious, "Don't Tell Me Now" is more of a slow burn. At first the difference from the first jarred me and left me disappointed. Over time though I started enjoying it more and more. For a time I even claimed I preferred it to the original. I now kind of hold them up as equals. Different but equal. "Mercury Blues" and "Inbred Heart" are insane songs. Pretty much all of side 2 is pretty great. The only hiccup is "Bombshelter Pt. 2" which isn't really a bad song, it is just about 2 minutes too long. It also would have been better as an album closer, not the fourth song. Anyways, when any of these songs come up on the shuffle I still always turn up the volume just a bit.